First -- thanks to all who expressed concern and support for my "furry kids". My dogs are like my kids to me, so any health problem is a big deal. Sarge is dong much better. He still has a slight limp, but it is definitely getting better. Of course, he especially likes the new diet and the extra couch time. Now, onto the markets. The market has been rallying for the last 6 days and has established two upward trending channels. This is a good sign for the bulls. Here is the 6-day chart which shows the entire pattern. Here is he daily chart. As I have noted, my primary concern with this chart is the lack of volume. However, that could be explained by simple, post-sell-off concern about the quality of the overall market right now. There are some other very postive signs in this daily chart. Note the 10 and 20 day SMA are now starting to move up. Should the overall market trend continue we will see the 10-day SMA cross the 20 day SMA in the next two weeks or so. If this happens we'll have another bullish signal. Also note that prices are over the 200 day SMA, which is the standard line the separates bull and bear markets. Here's a 1-year chart of the daily MACD. Notice that it has started moving up again. Here's the 3-year, weekly chart of the MACD which also shows a possible reversal of the sell-signals from the indicator. 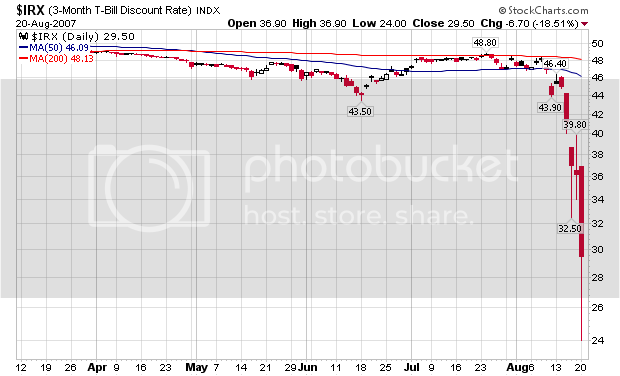 The Fed's lowering of the discount rate is the obvious catalyst for this advance. However, there have also been fundamental reasons for the underlying uptrend. For example, there was no news of any hedge fund blow-ups last week. I have commented before that it will take 2-4 weeks of no news weeks for a solid change to happen in investor psychology. Now we have 1 week. The Federal Reserve Bank of New York targeted investor gridlock in the asset-backed commercial paper market today, giving banks new information on how they can use such securities as collateral in exchange for central bank loans. ``In response to specific inquiries, the Federal Reserve Bank of New York has affirmed its policy to consider accepting as collateral investment quality asset-backed commercial paper'' for discount-window loans, Andrew Williams, a spokesman for the bank in New York, said in an interview. The clarification is the latest effort by central bankers to lubricate credit markets, which have shut out some companies after a slide in the value of securities backed by subprime mortgages. The Fed a week ago cut the so-called discount rate on direct loans to banks and encouraged lenders to use the resource. The four largest U.S. banks borrowed $2 billion this week. In short, there are signs that various actors are starting to make the beginning moves needed to unlock the credit markets. I want to caution here -- we aren't out of the woods by any stretch of the imagination. There are some serious problems in the financial market right now that aren't going away anytime soon. And we are still a few announcements of big problems away from another sell-off. In other words, if you're going long right now, make sure you have sell stops set. The markets are closed. It was a pretty good week overall. Stop thinking about economics. 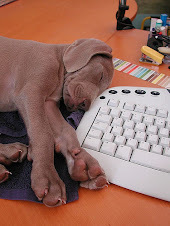 Better yet -- take a nap. OK -- short version. I thought one of by dogs was injured a whole lot worse than he actually is. Although there is one really funny part to the story. I got Sarge as a rescue dog about a year ago. 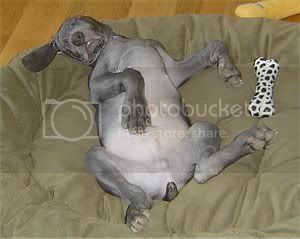 He's always had a slight limp. I simply thought he was abused or something happened to him when he was living on the street. It turns out his right elbow has an old through-and-through gunshot wound. In other words, Sarge has an old war wound. Go figure. Anyway, my boy will be fine. He's on anti-inflammatory and pain killers right now. In fact, I think he's a little stoned. But he's going to be fine. Now, onto the new home sales data. Sales of new homes increased 2.8% in July to a seasonally adjusted annual rate of 870,000 as the inventory of homes for sale dropped for a fourth straight month, the Commerce Department estimated Friday. Sales were stronger than the 820,000 annualized pace expected by economists surveyed by MarketWatch. See Economic Calendar. In addition, sales in June were revised slightly higher. Sales are down 10.2% compared with last July. Read the full report. "Given the volatility inherent in the data and the troubles in the mortgage market, however, it is unlikely that July represents a turnaround in housing trends," wrote Celia Chen, an economist for Moody's Economy.com. "At best, it will be the first sign of a slow and unsteady climb back to health." 1.) I'm having a hard time buying the 2.8% increase. All of the homebuilders have announced poor results this quarter. None have even hinted at the possibility of a rebound. We've had a ton of mortgage lenders issue terrible statements about their business. And suddenly new home sales increase? I'm just having a hard time buying that. 2.) The big jump came from the West, which increased 22.4% from month-ago levels. For anyone who has been paying attention, the West (especially California) has gotten hammered over the last 6 months. That makes this increase hard to swallow. That doesn't mean it couldn't happen, just that the overall environment isn't conducive to that kind of pick-up in activity. For more information check out Calculated Risk, which has been all over the California market. 3.) The total inventory available for sale has decreased 6.9% from year ago levels. That is a very positive sign. One of my main concerns about the new and existing home sales markets is the incredible inventory overhang. As long as that has been out there I have been very bearish on real estate. It looks like we are starting to see this total drop a bit, which is a very good sign. However, we still have a long way to go. I have an emergency that needs immediate and undivided attention. I'll be back posting on Sunday or Monday. Despite news of Bank of America's buying $2 billion in Countrywide stock, the market failed to follow-through on a strong opening. 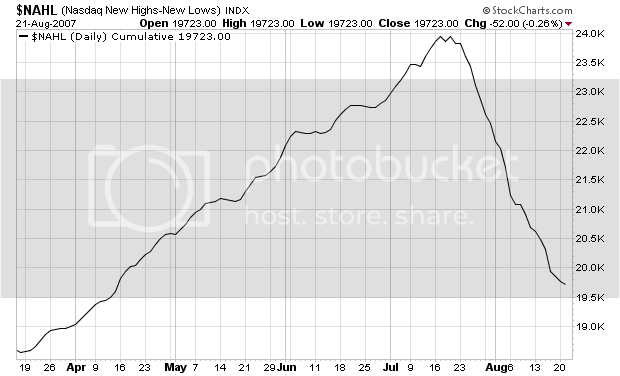 However, the market regained some momentum after lunch and rose a bit from its mid-day lows. Here's the 5-day chart, which is very encouraging to the bulls. I have given the average two channel lines in red to make them more visible. Also notice there are now several lines of support below the current price. Since the Fed lowered the discount rate, the market has been cautiously bullish, slowing moving up over the last 5 days. The 5-day chart still has the main problem it it yesterday -- lack of volume. However, we still have a decent rally from the lows of last Thursday. Also note the close is above the 10 and 20 day SMA, which will add some upward pressure to these averages. 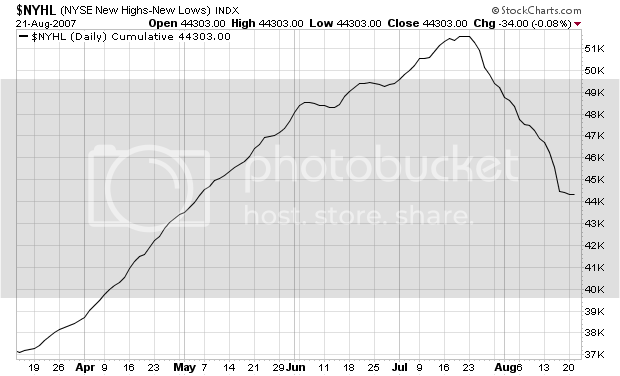 Finally, the average is over the 200 day SMA which is another encouraging sign. Mozilo said he continues to believe the housing downturn will take the U.S. economy into a recession. "I still think so, I've been proven wrong so far," he said. "But I can't believe when you're having the level of delinquencies, foreclosures … that this doesn't have a material effect on the psyche of American people and eventually on their wallet." "It seems to me, I don't see a light here at the moment," Mozilo added. "Something could happen that could change that overnight, but it appears to me we've got a way to go to work our way through." CEOs are media savvy people; they understand the market listens to their every word. As such, they are usually very optimistic, or at least very obtuse to prevent straight-forward analysis. When a CEO uses the word recession, it's an important event. Whether it happens or not is a different story. However, if he's thinking about it, he's also preparing for it. But at the same time, the chief of the largest U.S. mortgage lender remains cautious towards the current state of the industry. "This environment is certainly not getting better," he said. "Something tomorrow could turn it around, but this is a first step in series of steps we're going to take." See the point above. Now, it's possible he's overstating the case in order to get the Federal Reserve's attention in order to prompt the Fed to lower rates. Remember this is a very powerful CEO with lots of connections and clout. However, it's also possible the conditions are exactly as he says they are, so the market are still hurting. U.S. Treasuries fell, led by two- year notes, as a cash infusion for Countrywide Financial Corp. fueled speculation the crisis in credit markets is waning. Notes tumbled and traders reduced bets the Federal Reserve will cut interest rates after Countrywide, the biggest U.S. provider of home loans, said it sold $2 billion of preferred stock to Bank of America Corp. Countrywide was among lenders that drove investors to the safety of government debt in the past month because of losses tied to a U.S. housing slowdown. Bank of America Corp. bought $2 billion of preferred stock from Countrywide Financial Corp., erasing concern the nation's largest mortgage lender will go bankrupt and boosting investor confidence in stocks worldwide. The cash infusion gives Countrywide the funds it needs to keep making loans after the highest defaults on U.S. subprime home loans in 10 years drove up the cost of credit. That forced central banks to pump more than $400 billion in emergency funds into the money markets. Stocks in Europe and Asia advanced and U.S. stock futures climbed, while government bonds fell today. So far this financial crisis has played out in an interesting way. At first (and still) there is clamor for a rate cut from a variety of circles. However, the Fed has done everything it can to not cut rates. First they added liquidity -- but not that much compared to other regions. I have speculated this was a coordinated effort with other central banks, which would make sense as the problems hit worldwide. Unfortunately, this liquidity injection went straight into the T-Bill market. 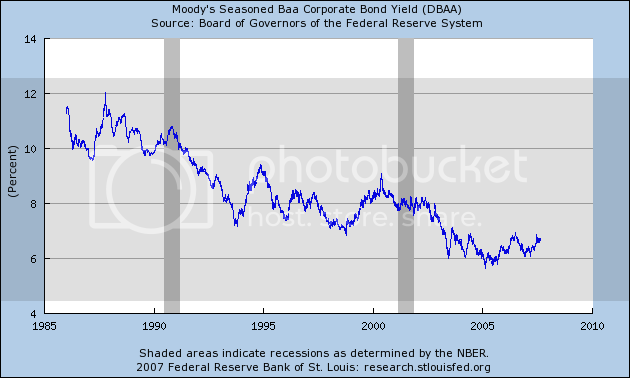 However, that appears to be changing, as T-Bill yields are backing off recent lows. This indicates recent purchases are probably being sold and moving into other short-term assets. 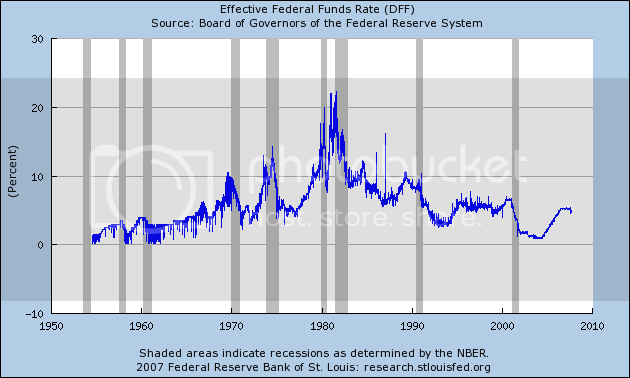 Lowering the discount rate was a way for the Fed to buy some time. It was about 75% psychological and 25% practical. I'm guessing the announcement yesterday that the four largest US banks borrowed from the discount window was a coordinated publicity effort. But, it may have helped to buy some time. And Fed President Lacker's recent comments may indicate the Fed isn't going to cut rates just because of the problems. Yesterday, the WSJ's Marbetbeat Blog ran a story titled Five Reasons the Fed Won't Cut Rates. Absent from this list was the dollar's value, which has been dropping for the last year or so and is currently trading near multi-year lows. I think this adds another very important reason why the Fed doesn't want to cut rates. I am beginning to think the Fed is "jawboning" the private sector and working quietly behind the scenes encouraging parties into action without any action from the Federal Reserve. Think of this as a Physician, heal thyself scenario. And it looks like Bank of America has listened and is taking action based on the Fed's recent words. If we have more announcement like this over the coming weeks I would take it as a sign the Fed won't be cutting rates. General Motors Corp.'s move to cut production of full-size pickup trucks is underscoring fears that the auto industry is headed for a longer and more painful downturn in the U.S. than many had expected. A longer downturn, industry observers say, could threaten the turnaround plans of GM and the two other U.S.-based auto makers. U.S. auto sales declined sharply in June and July as falling home values and credit worries damped consumer interest. 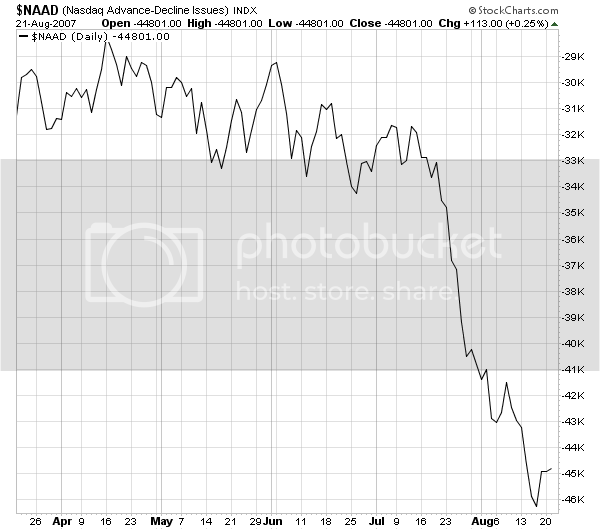 Early reports from dealers and market researchers have shown slight or no improvement this month compared with what was regarded as an unusually weak August a year ago. The sales weakness has hit both Detroit's Big Three and Japan-based auto makers like Toyota Motor Corp., which saw U.S. sales drop last month after a string of healthy increases. "It's pretty scary. The consumer has pulled back," said Michael Jackson, chief executive of AutoNation Inc., the country's largest chain of auto dealerships. Retail auto sales, or sales to individual consumers, are "a disaster," he said. This months retail sales were fair, but not great. Consumer spending only increased 1.5% in the latest GDP report. And consumer sentiment dropped in July thanks to stock market turmoil. Now we have executives at large, national car sales chains saying that sales to individual customers are a "disaster". Consumer spending is not looking good right now. And that does not bode well for the economy. Wall Street firms, which had raced to buy mortgage originators to feed their lucrative business of packaging the loans as securities, marked a retreat from that tattered field yesterday when Lehman Brothers Holdings Inc. said it will close its unit that lent to riskier borrowers. The closure will add to the thousands of layoffs related to the subprime pullback. Lehman will take a $25 million charge and a $27 million write down on the closure of its second-biggest mortgage originator. The firm will lay off 1,200 people, representing 4.2% of Lehman's total work force. In the last 10 days, more than 12,000 workers have lost their jobs at mortgage originators that include big names such as Countrywide Financial Corp. and Accredited Home Lenders, which laid off 1,600 people yesterday. "Lehman is probably making a statement that the subprime market isn't going to make quick recovery. This is not a one-month event," said Brad Hintz, an analyst at Sanford C. Bernstein & Co. and a former chief financial officer at Lehman. "You're not going to pull out of something if you anticipate the market is going to come back quickly." Subprime-mortgage lender Accredited Home Lenders Holding Co. will stop taking new U.S. loan applications and will cut more than half its staff to cope with credit-market turmoil. The San Diego company, long viewed as one of the stronger independent lenders for its relatively prudent underwriting policies, said "substantially all" of its retail lending business, which comprises 60 retail branches and five retail support locations, "will be effectively closed" as of Sept. 5, affecting 480 positions. Another 490 jobs will be lost in wholesale operations, which will close five of 10 divisions and cut staff at the other five. About 340 jobs will remain. The loss of financial service jobs over the last month has been very large. Simply put, it's going to hurt going forward. This was a pretty straightforward trading day. The market spiked in the morning on the ETrade news, sold-off until an hour before the close, then moved higher closing near the highs of the day. Late day rallies are a good sign because it indicates traders are willing to hold positions overnight. Here's the 5-day chart. Notice we have a 4-day rally in progress. We also have the average cautiously moving up. In short, this may be an indication traders are more willing to move back into the market right now. Here's the daily chart, and there is one point that creates a great deal of concern -- the decreasing volume of this mini-rally. In addition, notice the last four days candles aren't that strong; we're not seeing bold moves higher. Instead, we're seeing smaller bars. However, no rally is perfect, and these points may not mean anything. It's just as possible that the recent sell-off has naturally thinned volume in the markets for now. Subprime mortgage lender Accredited Home Lenders Holding is no longer accepting new U.S. loan applications and will cut more than half its work force as the company deals with the ongoing credit-market turoil. The San Diego firm said "substantially all" of its retail lending business, which is made up of 60 retail branches and five retail support locations, "will be effectively closed" as of Sept. 5, affecting 480 positions. Another 490 jobs will be lost at the wholesale operations, which will close 5 of its 10 divisions and cut staff at the other five. About 340 jobs will remain. Also, staff at Accredited's headquarters will shrink to about 220 from 400 and the company's settlement and insurance-services business "will be substantially reduced." No details on the unit's cutbacks were provided. Once the moves are completed, the firm's work force will be about 1,000, down from 2,600 as of June 30. Accredited's Canadian operations aren't affected by the restructuring. This week we've had job cut announcements of almost 21,000 this month -- before this announcement. This is only going to get worse at this point. Here's the chart of financial services job growth since 2001. Simply going from recent memory, the first big wave of mortgage problems hit at the end of last year/beginning of this year. Assuming my memory is accurate, that means the effects of these job cuts still aren't showing up on the financial services job results from the BLS. So far we have about an 8-month delay from the cutting of the jobs to the impact on national jobs figures. The point I am getting to is when will these cuts start to hit the national employment figures? Bulls have consistently cited job growth as a reason for their bullishness. The question is how long will job growth comply with this analysis? These have been remarkably resilient over the last year's slowdown in residential construction. However, it appears the boom in commercial construction is absorbing the job losses. In the latest GDP report we saw a big jump in commercial real estate development. But with the credit crunch going on, I have to wonder whether or not this trend will continue. The point is will the employment figures start to get a double-whammy hit from the loss in construction and financial service jobs over the next 6-9 months? Both of these ares are very important to this expansion's job growth figures. If both get hit at the same time, things could get ugly quickly. The asset-backed commercial paper market, where highly-rated lenders have gone for their short-term funding needs, is still broken despite the Federal Reserve's attempt late last week to fix the logjam in this key part part of credit markets. The Fed on Friday cut its discount rate by half-percentage point in an attempt to alleviate the pressure on banks that found their access to the commercial paper market shut off amid a crisis of investor confidence. "Apparently, the market's worse today than it's ever been," said Dominic Konstam, head of interest rate strategy at Credit Suisse. "The big failure to roll HBOS paper in Europe has upset people." Earlier Tuesday, the U.K.'s biggest lender HBOS PLC (HBOS.LN) said its credit-investment vehicle Grampian will repay maturing asset-backed commercial paper from the bank's balance sheet rather than tap credit markets. The yield on the benchmark 30-day asset-backed commercial paper index quoted by broker deals has reached 6.05%, from 5.30% a couple of weeks ago, Konstam said. "In total, a couple of hundred billion of asset-backed paper in the US is at risk of not rolling," he said, meaning companies will be unable to raise new funds in this market to pay off maturing debt. The short version is we're not out of the woods yet. Not by a long shot. In response to a question, Lacker also underscored the Federal Open Market Committee's determination not to insure poor investments with a cut in the federal funds rate. Ten-year U.S. Treasury notes fell in response, pushing the yield up 4 basis points to 4.63 percent at 7:32 a.m. today in New York. These charts are from Stockcharts.com. They indicate the internals of the market are still weak. These are the kinds of charts that bolster the bears' argument. Toll Brothers Inc.'s fiscal third-quarter net fell 85% as the luxury-home builder recorded more land writedowns amid continued slowing in new home construction. Chairman and Chief Executive Robert Toll said in a statement that the builder had experienced "a much higher rate of cancellations than at any time in our 21-year history as a public company" due to the downturn in the housing market. For the quarter ended July 31, the Huntingdon Valley, Pa., firm posted net income of $26.5 million, or 16 cents a share, compared with $174.6 million, or $1.07 a share, a year earlier. The latest quarter's results included pretax writedowns of $147.3 million. Toll said two weeks ago it would record pretax writedowns of $125 million to $175 million as home builders lower the value of undeveloped land on their books. Excluding writedowns, earnings for the fiscal third-quarter would have been 70 cents a share, the company said. The mean estimate of analysts polled by Thomson Financial was for a loss of 2 cents a share. Although this should not surprise anybody, it's still important news. Anyone who starts to say the housing mess is bottoming should be shot at this point. Problems in the nation's housing markets have prompted many of the 20,957 job cuts announced by financial institutions since the beginning of the month, according to Challenger, Gray & Christmas. Moreover, 11,040, or 53%, of those cuts have come since last Friday, the global outplacement consultancy reported on Tuesday. According to Challenger's data, the financial industry has announced 87,962 cuts so far this year. That's 164% more than had been tallied up through the end of August in 2006, the firm said. Forty-one percent of the cuts this year were related to mortgage and subprime lending markets, the data showed. This upward sloping line in the financial services job sector won't be around for much longer. 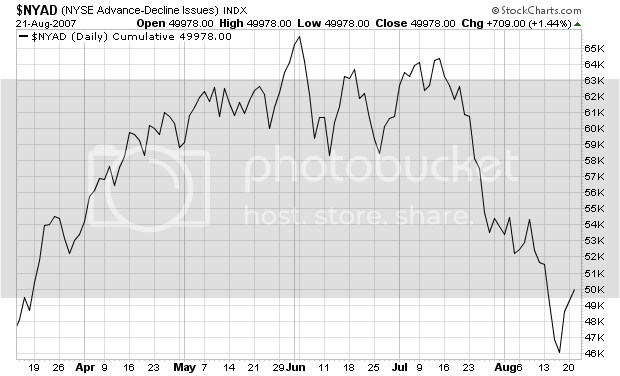 The market was lacking in any direction today -- no trend lasted longer than 2 hours. The market consolidated at the open, rallied in the late morning, dropped and consolidated until 1 PM, dropped and then rose in the last hour and a half. Traders simply had no idea where they wanted to go. The good news is the market didn't drop. The bad news is we barely went anywhere. Here's the 5-day chart. Notice we have a little 3-day trend in the making. We're moving up slightly. However, I would call this more a stabilizing move than anything else. Here's the daily chart. The SPYs are still bumping up into resistance. Considering all of the volatility over the lest month, this really isn't a bad thing. The markets appear to be catching its breath from all of the craziness of late. Are Central Banks Working Together? As expected, the European Central Bank gave cash-hungry institutions extra funds in its regular weekly refinancing operation Tuesday. The ECB allotted 275 billion euros (US$370.84 billion) in one-week funds, which is 46 billion euros more than it estimated banks need for routine business. Other central-bank injections Tuesday also aimed to calm money markets. The U.S. Federal Reserve injected $3.75 billion, following the $3.5 billion it put into markets Monday. The Bank of Japan put 800 billion yen (US$6.96 billion) into its market, following a 1.0 trillion yen infusion Monday. The Reserve Bank of Australia bought a total of 3.57 billion Australian dollars (US$2.88 billion) in securities. Meanwhile, Russia's central bank hurried to buoy the weakening ruble and keep money rates stable. In a rare move, Russia's central bank sold around $4.5 billion dollars on the market Tuesday to help support the ruble, traders said. It also injected 87.8 billion rubles ($3.2 billion) into the market through two one-day securities repurchase agreements. Japan's finance minister, Koji Omi, said he spoke by telephone with U.S. Treasury Secretary Henry Paulson to work together closely to monitor the recent financial market turmoil. This looks like a coordinated effort to me. And if it is, all the better. Retailers struggled to sell shirts, shorts and shoes in July as shoppers spent less while they grappled with economic anxieties and volatility that has rocked financial markets. With nearly all of the nation's major retailers reporting sales results to the International Council of Shopping Centers, the cumulative gain stands at 2.6%, according to Thursday's data. Analysts had been expecting that sales at stores open longer than a year, the industry's most important performance measure, would be weak, particularly among teen and women's-wear retailers. But the early results suggest that consumers across the board are far more concerned about credit and financing woes sparked by the slowdown in the U.S. housing market and the collapse of the subprime mortgage business. "I had thought that we'd have a number that was better than this," said ICSC chief economist Mike Niemira. "Certainly the macroeconomic slowdown that we've seen since last summer has taken its toll on consumer spending -- directly through the housing channel and indirectly through the home-value concerns." According to the report, high-end companies and discounters did well. Back to school sales (read teenagers) weren't around at all. At least not yet. 70% of the economy is not happy about what is happening in the economy and they are showing it through their wallets. Remember in the last GDP report personal consumption expenditures increased 1.5% -- one of the smallest gains during this expansion. If we see more numbers like this, we can probably expect a repeat of numbers like that. 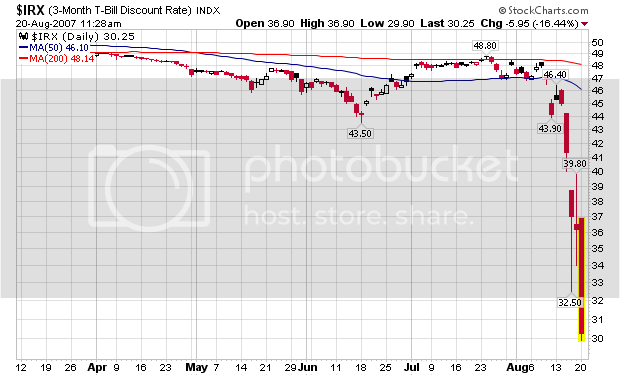 Did The Discount Rate Increase Fail? Stock and bond markets initially reacted positively to the Fed's overture, but grew more skeptical as this week began. The reaction yesterday in the Treasury-bill market can be seen as "a vote of no confidence in the Fed's move," said Larry Dyer, an interest-rate strategist at HSBC Securities in New York. 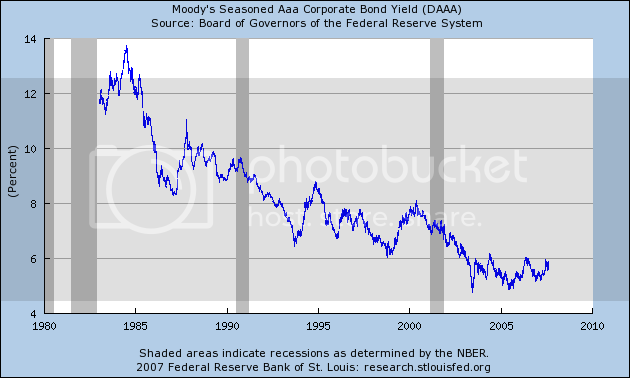 "If people felt that the end of the problem was around the corner, yields would be higher. But we're still seeing a continued flight to quality, and that's not what the Fed wanted." The $1.1 trillion market for commercial paper used to buy assets from mortgages to car loans has seized up just as more than half of that amount comes due in the next 90 days, according to the Federal Reserve. Unless they find new buyers, hundreds of hedge funds and home-loan companies will be forced to sell $75 billion of debt backed by mortgages, according to Zurich-based UBS AG, Europe's largest bank. Those sales would drive down prices in a market where investors have already lost $44 billion, based on Merrill Lynch & Co.'s broadest index of floating-rate securities backed by home-equity loans. That may hurt the 38.4 million individual and institutional investors in money market funds, the biggest owners of commercial paper. ``We're dumping all this collateral into the market and it becomes a death spiral for the assets,'' said Brian McManus, head of collateralized debt obligation research at Charlotte, North Carolina-based Wachovia Corp., the fourth-biggest U.S. bank by assets. CDOs contain pools of mortgage securities that have been repackaged and sliced into pieces. This is an issue of confidence. The market doesn't have any right now and the Fed can't give it to the market. The buyers' strike has hit the riskier commercial paper - that issued by companies with lower credit ratings - and whose yields have jumped more than 10 per cent in a month. According to the US Federal Reserve, these companies now have to pay an average interest rate of 5.9 per cent on their floating rate, 30-day commercial paper compared with 5.36 last month. "Liquidity concerns re-main the paramount issue for investors amid current volatile market conditions," Lehman Brothers credit strategists wrote in a note to analysts last week. When insiders start to make these type of predictions, you know there is trouble underneath. Considering foreclosures eventually lead to bond defaults, this is not a good development for the markets right now. Capital One (COF - Cramer's Take - Stockpickr - Rating) slashed its 2007 guidance by almost a third and said it will close its GreenPoint Mortgage unit, cutting 1,900 jobs. The McLean, Va., company said it now expects to make $5 a share for the year, down from the previous $7.15. Capital One will take a charge of $860 million to write off the value of GreenPoint, which it acquired last December in its purchase of North Fork. "The reductions in demand and pricing in the secondary mortgage markets make it difficult to operate our wholesale mortgage banking business profitably," said Gary Perlin, Capital One's chief financial officer. "Beyond that, Capital One's other businesses are supported by ample liquidity and funding including deep access to deposits, a 'stockpile' of subordinated credit card funding in place that allows approximately $9 billion of AAA credit card funding going forward, and a $25 billion portfolio of highly liquid securities." Don't expect this chart to look this good for much longer. Here's a shocking news flash -- the markets were really volatile today. The market consolidated in the morning, sold-off and formed a double bottom and then rallied into the close. Lowe's earnings announcement helped to spark the markets higher. The rally should help to soothe concerns about the markets -- at least in the short term. Here's the 5-day chart. Notice the market is in a slight uptrend. Here's the 3-month chart. Notice the SPYs are still bumping up into the upper trend line. Finally, here's a chart of the XLK (technology). This is the second largest S&P 500 sector behind financials and it is barely holding onto its uptrend. This week is very important for this part of the SPYs because it could hold the key to whether or not the index advances or declines. Those looking for clues to the extent of the spreading fungus should understand that there really is no comprehensive data to allow anyone to know how many subprimes actually rest in individual institutional portfolios. In my opinion, this is the biggest issue the markets face right now. We simply have no idea how many bad loans are out there. Just as importantly, we don't know where they are. 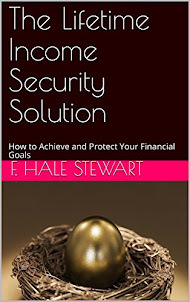 As a result, the entire financial system is being held hostage by the fear that the next shoe could drop at any minute. This acting as incredibly strong resistance to any upward moves in the market. This is obviously not welcome news, but it shouldn't be surprising. Investors' focus is turning to ``the amount of job cuts you're going to have from this fallout,'' said Sean Murphy, a Treasury trader and strategist in New York at RBC Capital Markets, the investment-banking arm of Canada's biggest bank. Treasuries headed higher after SunTrust Banks Inc., the seventh-largest U.S. bank, said it expects to eliminate 2,400 jobs by the end of next year as part of a plan to cut costs. That may signal the credit crunch in the U.S. will cost jobs and may slow the economy. Countrywide Financial Corp., the biggest U.S. mortgage lender, has started laying off workers who originate loans as it cuts costs as part of a plan to survive the credit crunch, the Wall Street Journal said, citing an internal e-mail. And anyone having no concerns about jobs or bankruptcy at Countrywide is either very foolish or simply is so well off that he/she does not need a job. One look at the Mortgage Lender Implode-O-Meter count now at sitting 128 should be enough to convince anyone. There have been a ton of bad reports coming out of the mortgage markets since the end of last year, accelerating over the last few months. But according to the graph, financial services are still adding jobs. At some point that's going to reverse. Treasury bill yields fell the most in at least two decades on speculation the expanding credit crunch will lead the Federal Reserve to cut borrowing costs next month. Three-month yields fell to the lowest since 2005. More than half of the 21 primary government security dealers that trade with the Fed now expect the central bank to cut its target interest rate by next month from the current level of 5.25 percent. The yield on the three-month Treasury bill fell 1.23 percentage points today to 2.53 percent as of 12:26 p.m. in New York. It's the biggest drop since at least Oct. 20, 1987, when it fell 85 basis points on the day the stock market crashed. There's more to this then betting the Fed will cut rates. 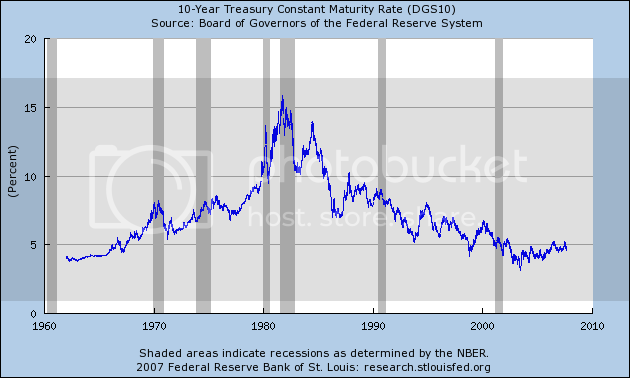 Short-term Treasuries are considered some of the safest investments in the world. Right now, investors are literally gobbling them up at the highest rate in 20 years. That means there is a whole lot of concern out there about liquidity and the credit crunch. In addition, the short-term Treasury curve indicates that flooding the system with liquidity won't solve the problem. Just because someone has the money to lend from a liquidity injection does not mean they will use that money to make loans. Here's a chart of the short-term Treasury curve to illustrate that point. The bottom line is this is a liquidity issue -- people don't want to make loans right now. There are two areas to watch this week. 1.) The Yen: The carry-trade is a primary financial force of this expansion. Because Japanese interest rates were so low for so long, investors borrowed money in Japan and invested it where interest rates were higher. This was basically a financial no-brainer for for the 5 years or so. However, the Yen has been spiking for the last few trading days. As US investors sell US assets to take profits, they are simultaneously buying yen to repatriate profits and pay back loans. 2.) The short end of the curve: The 3-month Treasury Bill lost about 100 basis points in yield last week as investors sought safety. 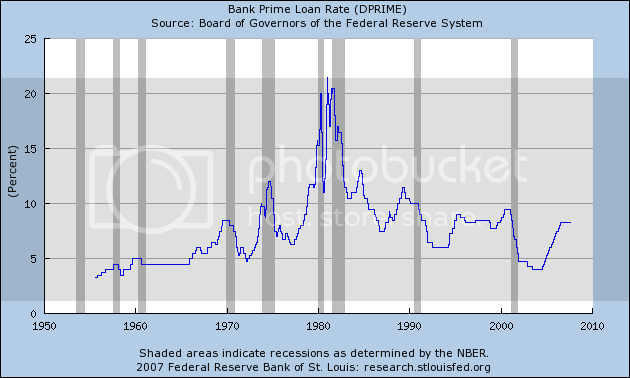 This is probably one of the reasons the Fed lowered the discount rate. All of the cash they pumped into the market was moving into Treasuries rather than liquid assets. A continued increase in the Yen or decrease in short-term yields will probably concern the markets going forward. As of this writing (6 AM CST) Photobucket is down. I'll have the charts as soon as Photobucket is back up. These total 70% of the index. Here are the 3-year charts in order of largest percentage to smallest. Technology is barely holding on to a year-long rally. It has sold off on high volume the last three weeks. A move below the trendline would obviously indicate selling pressure still remains among traders. Health Care broke a year-long trend in late July and is currently looking for a bottom. Industrials have broken a short-term upward trend but are still above the trend-line of their year-long rally. Don't be surprised to see this sector move down to its year-long trend line and testing that level. Energy broke it's upward moving trend line in a similar manner as industrials. However, this sector has a ton of support from the year long consolidation pattern in 2006. Two sectors -- financials and health care -- have already broken their trend line. This is obviously bearish. Technology is hang on. This week's action will be crucial. Industrials and Energy are doing pretty well. Anonymous: You are correct about the SPYs. They are the ETF tracking fund for the S&P 500. Sven: How to I weigh technical indicators? That's a really good question. I'm a big fan of using very simple tools. Over the last 30 or so years a number of technical indicators have been developed which I am not a big fan of. It's not that they're bad, it's that I think they are too complicated. I like simple moving averages, general trend lines and the MACD. I'm also a big fan of volume analysis and indicators that incorporate price and volume. However, I'm very old school when it comes to technical analysis, relying most on the writings of Gartley, Gann and Schabacker. For anyone who wants to learn about technical analysis, I would highly recommend all three of the preceding authors. Bohewasp: I have no idea what banks are member banks of the Federal Reserve system and I have no idea where to look. Anyone who has an idea please list in the comments.